The mini stepper is a really simple piece of exercise equipment that virtually anyone can use to help burn a few extra calories. But with so many to choose from how can you work out the best mini stepper machine for you? In this article we’ll go over why a mini stepper makes a really good purchase, who the main manufacturers are and where you can find them. We’ll also have a look at a few exercises to get you started. Read through, or use the navigation below to jump ahead to the sections you’re interested in. 1 What is a Mini Stepper? 8 So what are you waiting for…? What is a Mini Stepper? As the name suggests, a mini stepper, sometimes know as a mini step machine, is a smaller version of the stepper machine you would typically find at the gym. Like its parent machine, the mini stepper offers a cardio-based workout focused on low-impact (easy on the joints) moves that get your heart pumping. It has two foot stepper pedals that move up and down on opposite intervals, simulating going up stairs. Most models come with adjustable resistance, allowing you to set your own intensity level for a workout. Unlike its parent machine, however, this version can easily be found in your living room, closet, cupboard, or garage without any trouble at all. Most mini steppers also include one of two additional features: handles or resistance bands. As they are a bit difficult to keep your balance on without support, these features are included as stabilizers. Models with resistance bands have the added bonus of including an upper body workout as well. Resistance bands, which are large, round elastic bands attached to grip handles, allow you to work your arms, shoulders, and chest as you pump up your heart rate and work your legs. From walking to water aerobics, it’s obvious that exercise is good for you. Daily movement has been shown to improve balance, foster greater brain function, and support healthy bones and joints. Exercise isn’t always the easiest thing to incorporate into daily life, but the mini stepper is a great tool to make exercise accessible and achievable. This is just one of the many benefits of using a mini stepper. Portable – With mini in the name, you know it can’t be hard to take with you. Most models of the mini stepper tip the scale somewhere between 15 and 30 pounds. Combined with their trim size, typically around 20 inches x 15 inches, the mini stepper is easily packable. Whether jet-setting, road-tripping, or heading to see the grandkids for the weekend, the stepper can come along for the ride. 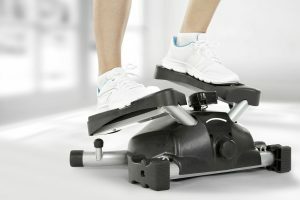 Affordable – As one of the least expensive home-exercise machines, the mini stepper brings a lot of cardio bang for its buck. With most models ringing up between $40 and $80, this small-but-mighty device puts little strain on your wallet. Supports Coordination and Balance – Muscles are the body’s main stabilizers, and exercising them is key to building strong balance and coordination. The independent movement of the mini stepper’s two foot stepper pedals, as well as the possibility of added movement from resistance bands, keeps the mind engaged, builds stabilizing muscle, and helps practice coordination. 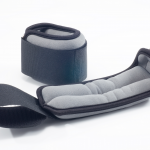 This can improve posture and help prevent the falls and injuries common in older adults. Indoors – Using a mini stepper has similar benefits to walking, but unlike its outdoor counterpart, it is conducive to any kind of weather. If it’s too cold, too hot, too wet, too windy, or generally too unpleasant outside for a walk, the mini stepper is the perfect alternative. Just set it up in any indoor space and you’re ready to get your heart rate going. Discreet – The mini stepper’s size not only makes it portable and easy to store, it also makes it possible to exercise without disturbing those around you. You can step while watching TV, making dinner, or reading a book. If you’re busy working at a desk, place your stepper beneath it. The short range of motion is ideal for quiet, unobtrusive exercise, and according to Dr. James Levine of the Mayo Clinic, you could burn an additional 100 calories per hour using a stepper at your desk. Easy to Use – Even if you have not used a single exercise machine in your entire life, the mini stepper is a straightforward piece of equipment. Put one foot on each pedal, step downward with one foot, allowing the other foot to rise at the same time. Repeat. It’s as simple as that. Mini steppers are an easy way to make exercise a daily activity. The benefits of using a stepper machine span the gamut from pocketbook to proper posture, and they are easy to take with you wherever you go. The only thing the stepper makes difficult is coming up with excuses to avoid exercising. Exercising regularly in small amounts is a great way to help you stay motivated, especially as you start to see results. These benefits make mini steppers one of the most popular types of home exercise equipment. But if you’re not sure whether the mini stepper is right for you, another option that you could consider is the compact treadmill. This is a low cost, portable variant of the standard treadmill that is great for running indoors at home. Many different companies offer a mini stepper machine in their inventory, each with a slightly different set of advantages. Whatever your particular needs, there is sure to be a model that meets them. 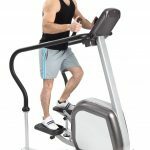 Twist and Shape Stepper – With resistance arm bands and unique side-to-side twisting motion, this machine targets your core as well as your legs. On the upper end of stepper weight, it weighs in at 27.5 pounds, but is still easy to carry and to store. Its LCD display tracks calories, repetitions, time, and rate (repetitions per minute), keeping you well informed on how your workout is going. Nordic Track Mini Stepper – This model offers a digital tracker which records your steps, calories, and time, as well as resistance bands to incorporate an upper body workout. Weighing just fifteen pounds, it’s easy to pick up and carry with you wherever need be. It’s also a fairly affordable model, running $49 at most retailers. 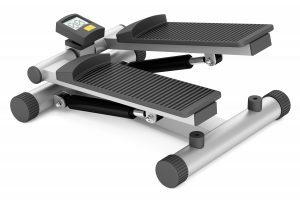 Loctek Stepper – The grey and blue appearance of this model brings a fun splash to your workout, adding to the practical benefits of the machine. This Loctek stepper offers sturdy, compact, and lightweight construction at just 15 pounds and 17 inches x 16 inches. Its tracker counts calories, repetitions, and time. At $78, it is right in the middle in terms of cost. Xiser Commercial Portable Stepper – Something like the Cadillac of the mini stepper world, the Xiser Stepper is made in the USA from recycled materials. Offering a five-year warranty, and weighing in at just fourteen pounds, this $400 model has much to recommend it. Adjustable resistance, high weight capacity, and a sleek, industrial look are all attributes to consider. Whatever your budget, desires, and needs, there is a mini stepper model for you. If it so happens that one of these models listed above does not meet your specifications, there are plenty more out there. A simple internet search will bring you a large array of options that you can pick and choose from. A mini stepper is very simple to use, but in case you aren’t familiar with the technique, this information should help you get started. Place one foot on each foot pad, moving them in opposite directions at the same time, such that your right foot would go up as your left foot would go down, and vice versa. If you are incorporating resistance bands, place one in each hand and move them up and down, mimicking a bicep curl, in rhythm with your steps. Repeat this motion. Keep your hips centered, with your feet, legs, hips, and shoulders all in alignment. Try to avoid leaning forward or backward, as well as pressing the footpads all the way to the floor. Both of these actions can cause you to lose your balance. If you’re doing it right, you should feel some muscle burn, particularly in your legs. It is meant to hurt a bit, and you shouldn’t be able to do it forever. Focus on your balance. Try to imagine you have a book precariously perched on top your head and you need to keep it there. Engage your core and try to make your motions smooth. 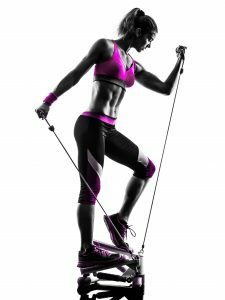 If resistance bands are on option on your model, they’re a great added workout. If they’re not, you can still work out your arms with some small dumbbells while you step. Try a professionally led workout video online. With different speeds and techniques, these videos can really help you incorporate more strength, balance, and cardio into your workout time. Mini steppers are easy to use from the start. Getting your form right will have a major impact on the effectiveness of your workout, increasing the amount of calorie burn and muscle build you gain from a single session. With the mini stepper, daily activity is an easy thing to check off the to-do list. While the use of a mini stepper is quite simple, it is often helpful to have an additional guide. These five mini stepper workout routines will help you get started with your new exercise habits. The Basic: Livestrong has a short, straightforward guide for a basic mini stepper exercise routine. Three stages of warm-up, thirty minutes of moderate intensity stepping, and cool down make it easy to get in shape with your mini stepper. 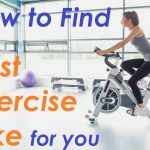 The Half Hour: Fitness Best Reviews, an online guide to exercise equipment, offers a guide to a great mini stepper workout with eight distinct phases. Clocking in at just 35 minutes, this exercise routine will be easy to fit into your schedule. Mix It Up: Offering four different options for mini stepper exercises, The Nest lets you mix and match to build a workout that works for you. 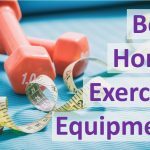 Want to use resistance bands? Need to use it sitting down? Want to amp up the resistance? The Nest’s guide accommodates all of these wishes and more. The Thighs: Looking to tone and strengthen your behind? 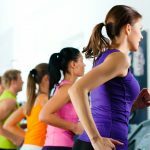 eHow has you covered with their mini stepper workout video that gives you all the tools you need to effectively work out the upper half of your legs. HIIT: If you’re feeling pretty ambitious, Xcise, a mini stepper producer, has some great resources for HIIT (High Intensity Interval Training) workout routines. These fast-paced workouts will get your blood pumping and your muscles working. Mini stepper results vary depending on how often you exercise and how strenuous your workouts are. While the mini stepper is not as effective as its parent machine, the stair stepper, it can still give you a great workout. 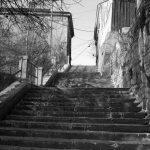 The cardiovascular benefits of a mini stepper are fairly similar to brisk walking, and can provide weight loss benefits similar to this as well. While the range of motion in a is a bit too small to effectively work your glutes (see video below) — you’d be better off using stairs or doing a hill workout for this — it is generally effective in toning your leg muscles. The specific number of calories burned on a mini stepper varies according to the duration and intensity of your workout, as well as your height, weight, and age. According to Livestrong, a one hour, moderate intensity workout can help a 120 pound person will burn about 350 calories, a 150 pound person burn about 430 calories, and a 200 pound person burn about 560 calories. When shopping for a mini stepper, it’s worth investing in a sturdy model that is built to last. A cheap mini stepper is unlikely to stand the test of time. As you incorporate your new mini stepper into your daily routine, it’s going to see a lot of use, and investing in a quality machine makes sense in the long run. Mini stepper price varies depending on the brand, model, and retailer. Good, quality mini steppers can be found at many major U.S. stores, including Sears, Walmart, and Target. 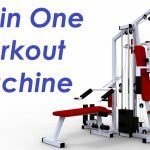 If you’re looking for a physical, brick-and-mortar store that has a mini stepper or stair stepper for sale, these outlets are likely to carry what you want. It’s also quite easy, and often less expensive, to buy a mini stepper online. Outlets such as Amazon, Overstock, and the online branches of physical stores such as Walmart and Sears regularly offer these machines. In some cases you can also buy direct from the manufacturers. If you’re looking for a really simple and inexpensive way to burn a few extra calories at home, then the mini stepper might be the right choice for you. Mini stepper training is a great way to introduce more exercise into your lifestyle. Not only will it help you lose weight, but you’ll also strengthen your core and improve your balance too. We’ve looked at some of the main manufacturers above, but there are many other varieties available, catering to everyone’s needs and price points. So have a look around, find one you like and you can start stepping right away. « Types of Zumba: Why Workout When you can Party!